I've been producing MODO tutorials since 2008, and these, by design, have been focused on showing you methods you can use on your own projects, rather than a "paint by numbers" approach, where you duplicate something I've already built. My personal interests obviously focus on aviation and aerospace. But, all of my tutorials below are about 3D modeling, texturing, rendering, rigging, and animation, and should not be considered as "airplane only" training. At the macro level, we all create and edit polygons, edges, vertices, etc., and the techniques used for creating aircraft are no different than the ones we'd use to create a car, ship, train, toaster, or chair. New MODO users might also note that although each new version of MODO has new tools and capabilities, the techniques shown in my earliest tutorials still work in the latest version of MODO. I hope you'll have fun with these, and that you'll be able to apply some of what I share in your own projects. For the next few months, I'm working on a real-world, passenger-carrying aircraft, two different large UAV projects, a very special scale display model, and several graphics presentations for aircraft marketing. I love being busy with this kind of work! This means that although I'm always collecting notes, there's been no time recently to create a new tutorial. If I hear from enough of you, indicating that there's interest, the next one (Volume Eight) will be a "Master Class", focusing on my experience in building precision scale models for both image and animation-based use, as well as manufacturing. Email me your thoughts. All products below are available for direct download, but due to their file size, they will time out in a regular browser. You will need to use FTP software. Both recommendations below are easy to use. For the next few months, I'm working on a real-world, passenger-carrying aircraft, at least two different large UAV projects, a very special scale display model, and several graphics presentations for aircraft marketing. I love being busy with this kind of work! This means that although I'm always collecting notes, there's no time to create a new tutorial right away. The next one will focus on new features in MODO 11 and 12, and I may have a chance to do it during the winter of 2018/2019. As always, I'm open to requests from those of you who like this sort of thing. Email me your thoughts. Click the bright blue links in the left-hand column below for a free preview of each tutorial. Note: Due to the digital nature of these downloads, all sales are final. This is, in many ways, a "Part Two", continuing from Volume Six. 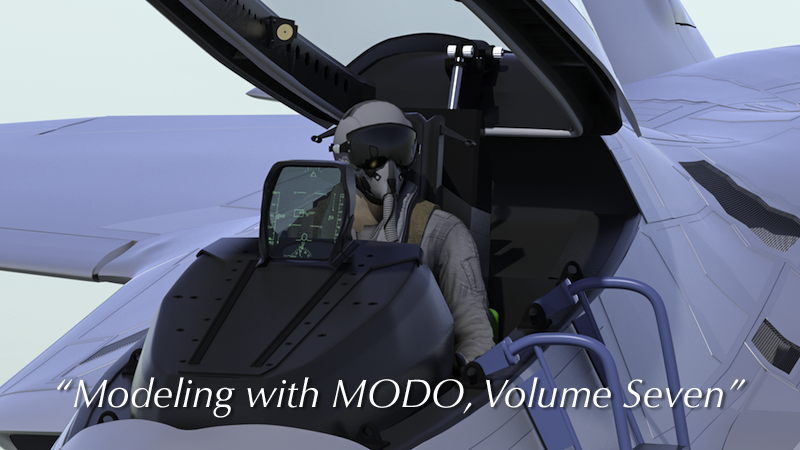 While Volume Six focused on the more traditional method of sub-d modeling, adding geometry to increase edge sharpness, this volume focuses on using edge-weighting instead. So, if you haven't already purchased Volume Six, I urge you to purchase both, to clearly see the comparison in methods. (Both produce equally high-quality models.) My 2015 model of the F-22 "Raptor" is the prime example used to illustrate these methods in Volume Seven. Of course, there will be many other subjects covered, including some of MODO 901's great new features, along with a variety of tips for modeling, rigging, materials, rendering, and animation, and some bonus "hardware" files for you to use in your own projects. Click the blue link in the left-hand column to see a preview. "Modeling with MODO, Volume Six - Building High Resolution Models with Catmull-Clark Subdivision Surfaces"
This tutorial focuses on creating very high resolution, detailed models, using Catmull-Clark subdivision surfaces. 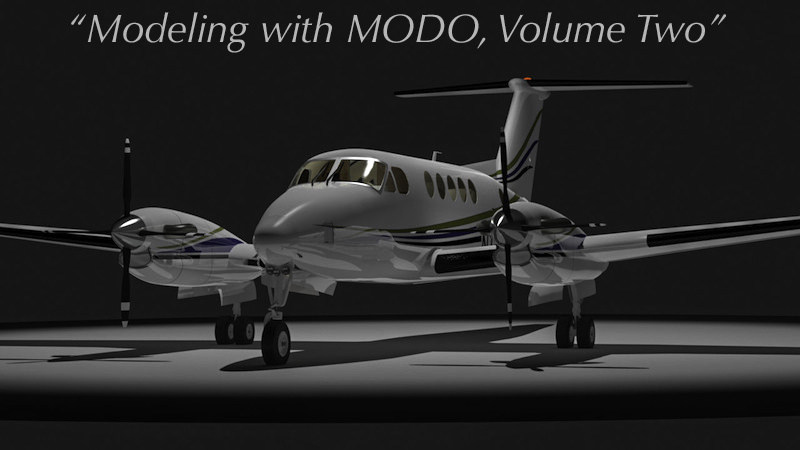 ("Psubs", in MODO) We'll use my new 2014 Piaggio P180 "Avanti II" model as the primary example, (See that article here.) which is all sub-d from start to finish, resulting in meshes with nearly all quad polygons (very few triangles) and no Ngons. Meet our new best friend, "MeshFusion". I've included a variety of examples showing some of the potential of this new magical plug-in. I'm also working on a "kit" for MODO users which is a set of all-quad, sub-d meshes suitable for kit-bashing your own aircraft and spaceship models, all designed to play nice with MeshFusion. See The Foundry's MeshFusion page here. Detailed descriptions, examples, and nearly 4 hours of videos discuss how to create the initial geometry from your documentation, how to make clean cuts in subdivision surfaces while avoiding smoothing errors, how to adapt to changes as the project moves forward, how to avoid various "traps" this sort of modeling can produce, more on how to extrapolate dimensions from unknown parts, and of course at the end, texturing, rendering, and animating all of these parts. This is my most advanced project to date, and I've learned a lot of handy tips and methods during the process, all shared here. "Modeling with MODO, Volume Five - Problem Solving"
As most of you know, my main use of MODO is design, modeling, and visualization. Although I tend to specialize in aviation/aerospace projects, the last couple of years have been filled with an enormous variety of subjects, including 3D patent drawings for a new kind of hair clip, a new Volvo hybrid bus, some organic visualizations for physical art installations, graphics for TV and print publications, and more. Thanks to the "Power SubD - NURBS" plug-in, I've also started to produce machine ready files for manufacturing of some large-scale, radio-controlled aircraft, and I've learned some tips to make this process pretty painless. This variety has forced me to find some new methods of doing things, and to solve problems in a timely, practical way, and that's what this training set is about. 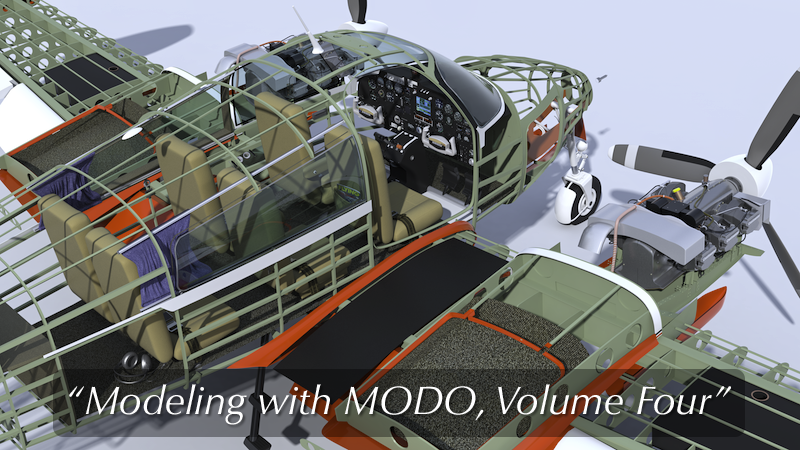 "Modeling with MODO, Volume Four - Details!" 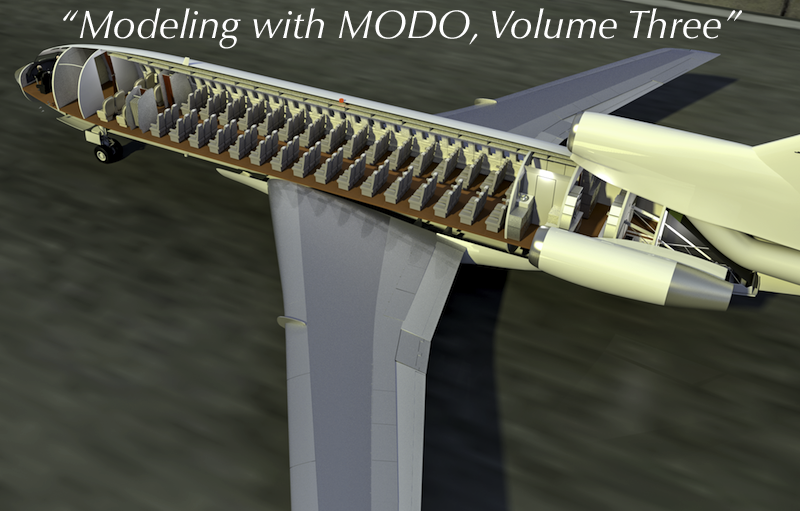 Two scale aircraft projects illustrate a variety of methods to extrapolate scale information from less-than-ideal documentation, and then to create all kinds of details, including an internal structure, cabin and cockpit detail, interior and exterior lighting, basic rigging for animation, and more. Several other scene files and tutorials, including the complete T-38 file, and a huge library of parts you can use in your own models. 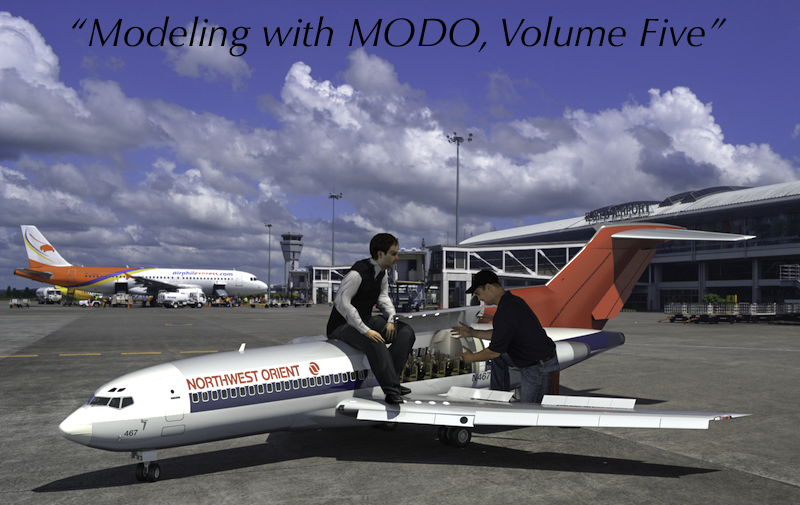 "Modeling with MODO, Volume Three - Jets!" As you can tell from the title, this set focuses on the creation of modern jet aircraft. I've included examples of fighter, bombers, business jets, and two major airliner projects. The same techniques apply to any modeling subject, so even if you're not an aircraft fanatic, I think you'll find a large variety of information that may improve your results. 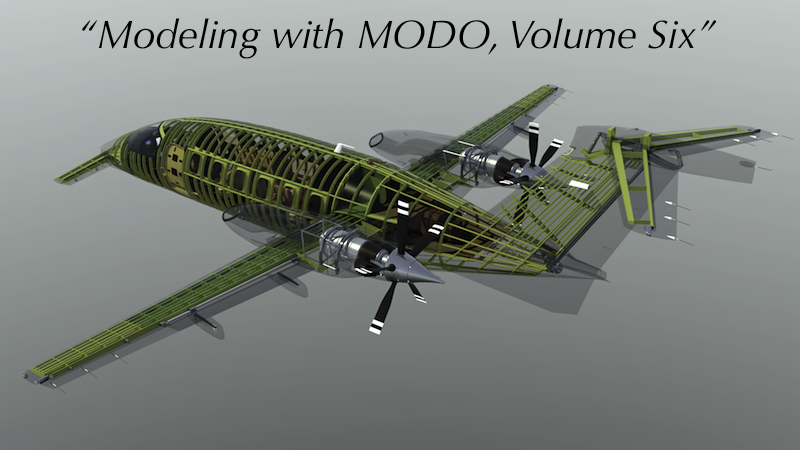 "Modeling with MODO, Volume Two"
First, a very large aircraft project focusing on the construction of the King Air B200 model, as well as a variety of systems, including animated versions of the de-ice system, fire suppression system, heating/cooling system, fuel system, and a fully-animated cockpit. A variety of large, organic visualizations for other artists, making extensive use of MODO's sculpting and painting tools. Several model and scene files are included too, in LXO format. 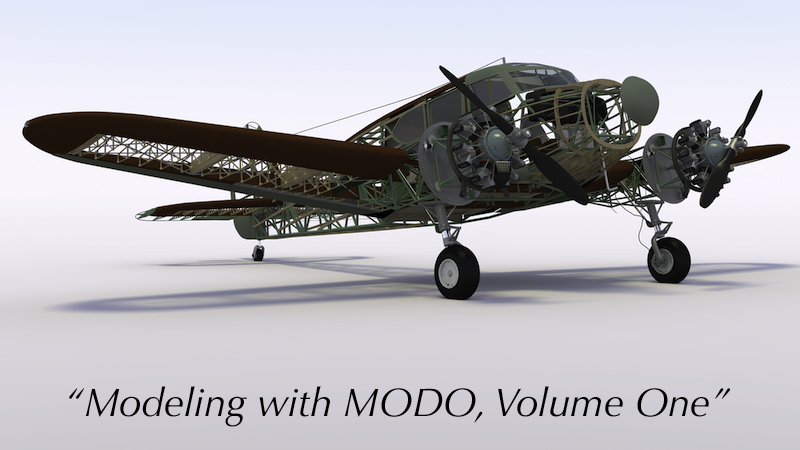 "Modeling with MODO, Volume One"
A huge variety of projects, from museum scale aircraft, to architectural visualizations, organic art, displacement exercises, future gadgets and vehicles, boolean operations, and modeling with spline cages. Several model and scene files are included too, in LXO format.